AlienVoIP is a great tool to enhance your business communications and make international calls anywhere anytime. Your company can save a lot of money by cutting down your communication costs. 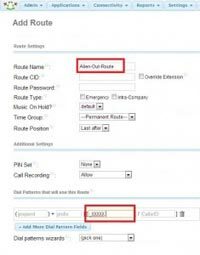 We provide setup guide for our users which describe the configuration of several VoIP softswitch such as FreePBX, Asterisk,3CX PBX for the use with our AlienVoIP system. FreePBX is an open source GUI used to manage your PBX. 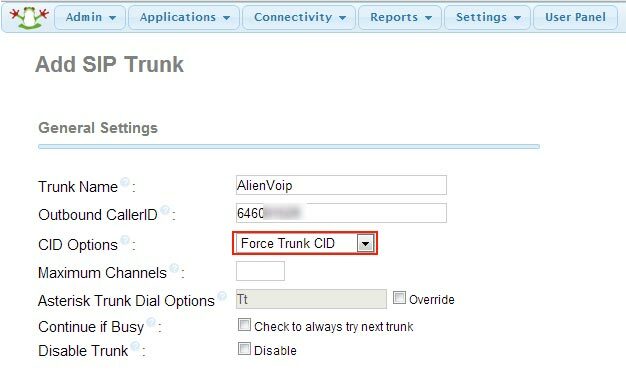 This guide below will show you how to setup AlienVoIP SIP Trunks with FreePBx. 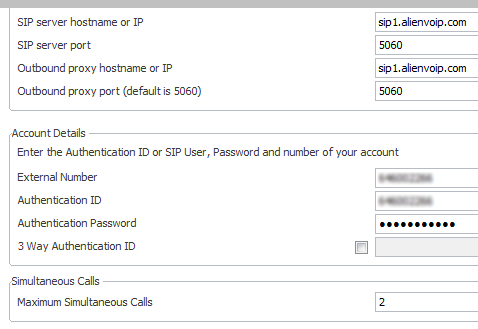 This is a common setup when using any VoIP provider SIP Trunks. 1. Login to your FreePBX. 2. Go to Connectivity > Trunks. 3. 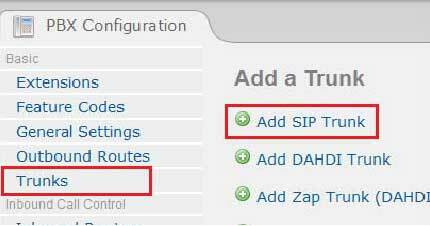 Click Add SIP Trunk. 4. 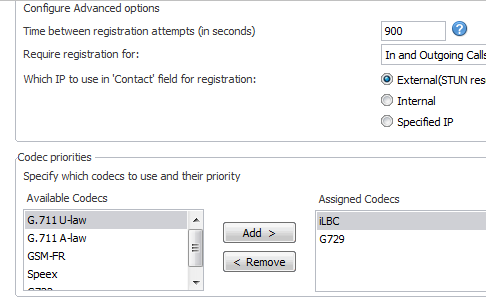 Key in Trunk Name and SIP number (OutBound CallerID). 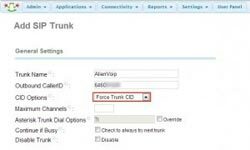 Then, select Force Trunk CID as CID Options. 5. Scroll down to Peer Detail, copy the following scripts and register string. Then paste them in the columns accordingly as shown below. Click “Submit Changes” after you have filled in the details accordingly. 6. Go to Connectivity > Outbound Routes. 7. Insert your Route Name and key in the dial patterns as _XXXX . 8. 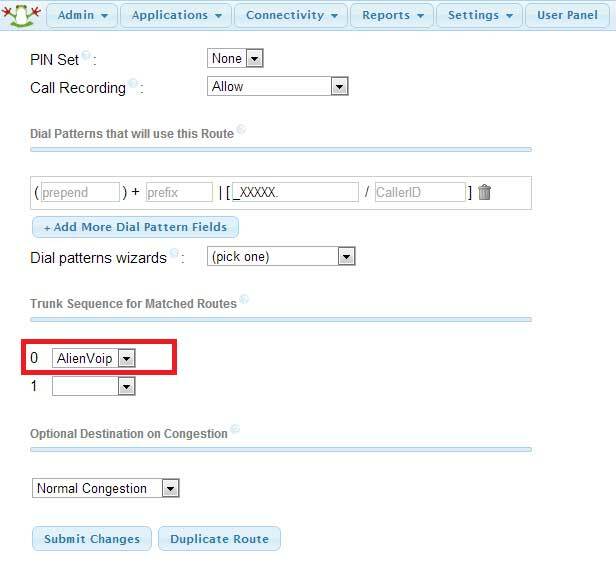 Scroll down and select AlienVoIP as Trunk Sequence for Matched Routes. 9. Click Submit Changes to apply configuration. 10. 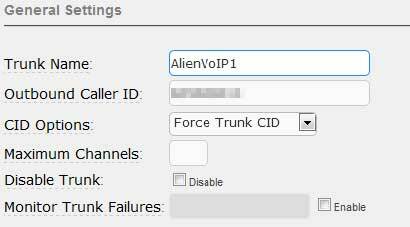 You can start using your FreePBX and enjoy AlienVoIP’s services now! Asterisk or FreePBX is an open source server based PBX system. It is widely used by business owners because its flexibility and lower cost. 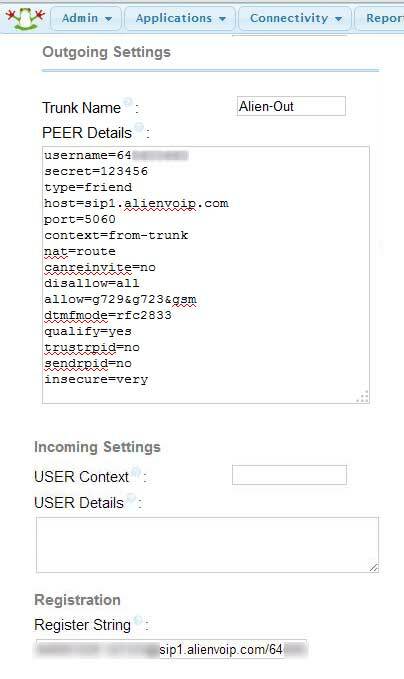 AlienVoIP is running on SIP protocol, hence it can be connected to any Asterisk based system. 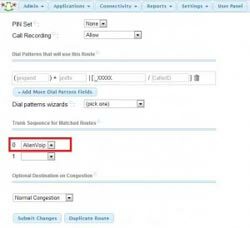 After configure with AlienVoIP SIP account, the Asterisk/FreePBX is able to make calls to PSTN network, which includes all mobile operators and fixed lines. Besides, by using AlienVoIP SIP trunking in Asterisk, the whole office will benefit from low cost communication while maintaining the voice quality. At the same time, the Asterisk PBX can be configure with dial plan to suit with the environment’s requirements. 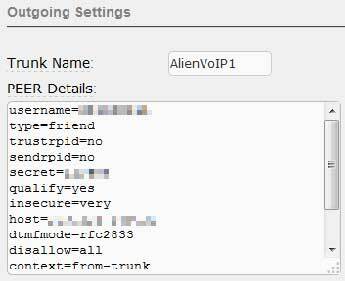 For instance, some calls are directed to AlienVoIP (specially oversea calls) and some are still using local provider. 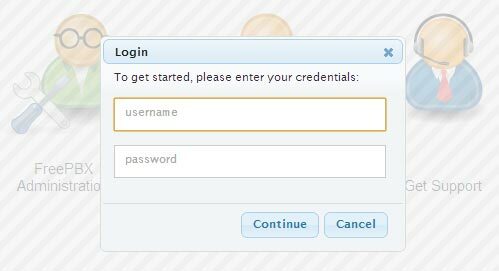 Before attempting to configure your Asterisk server, make sure that you are registered to AlienVoip and your account is activated with credits and at least 1 SIP username. The guide below assumes that you have an Asterisk server already running and have completed the necessary steps mentioned above and agreed to our terms and conditions. The example above is a general view of a basic dialplan in Asterisk, you can configure your dialplan to suit your need in your production server. 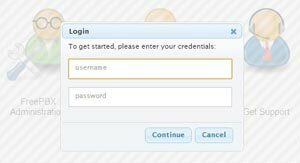 Please login to your ElastixPBX system. Go to PBX tab as shown. 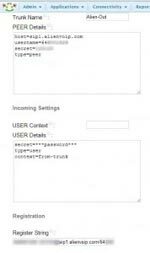 Fill up the your SIP account information as shown below. Fill up outgoing details as shown below. Peers Details: Please copy from text below to fill it up, replacing username and secret with your SIP username and SIP password. 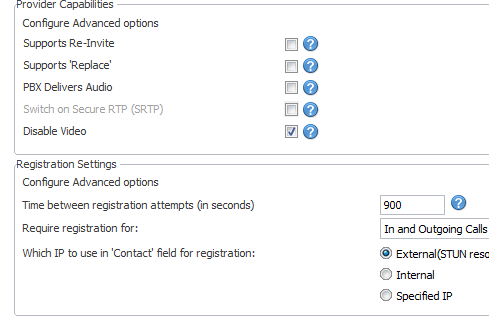 Leave incoming settings empty, skip to registration, replace with appropriate values and submit your changes. 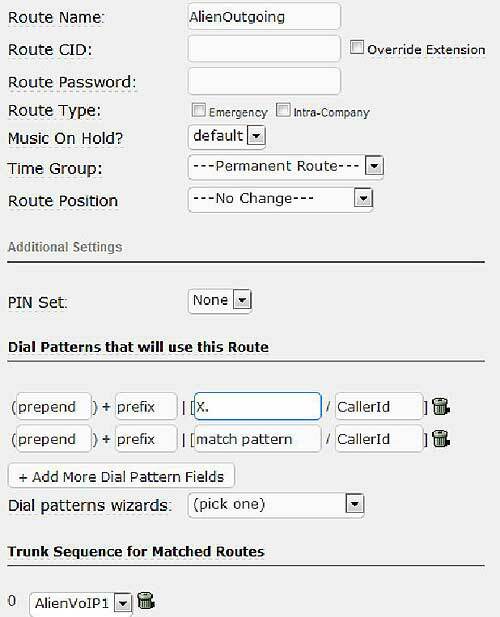 Next, go to Outbound Routes to add a route. And then submit your changes. 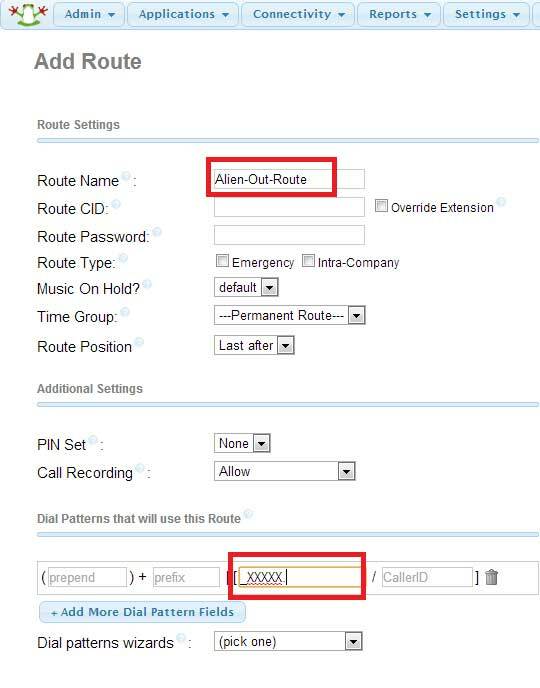 Once you have registered an extension to your ElastixPBX, any calls made should be routed through AlienVoIP. Below is the settings that worked. The first step will be to make sure the provider is registered. Go to “Remote Connections” and you should see that the status is registered.